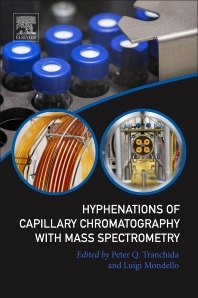 Hyphenations of Capillary Chromatography with Mass Spectrometry provides comprehensive coverage of capillary chromatography with mass spectrometry—both single and multidimensional approaches. The book examines nearly all capillary chromatography approaches, combined with a variety of MS forms, giving readers a wide and detailed view on current-day analytical strategies and applications. Of particular focus are novel developments in the field of MS, such as the Orbitrap, HR ToF, ToF MS with variable electron-impact energy, fast MS-MS and APGC technology. Junior scientists conducting research on mono-dimensional chromatography-MS fundamental relationships and experienced analytical chemists working in conventional capillary chromatography and classical multidimensional chromatography will find this an ideal application-based reference on the hyphenations of these domains. is co-author of approx. 90 papers, 16 book chapters and of over 220 oral/poster presentations in national and international meetings. In 2012, he received the "John Phillips Award" for his work in the field of comprehensive 2D GC. His main research activities are focused on the analysis of volatiles contained in complex samples, by using advanced gas chromatographic methodologies and innovative column stationary phases. In particular, he has acquired considerable experience in the use of fast and very-fast gas chromatographic techniques. Furthermore, he is actively engaged in the use of classical multidimensional GC and LC-GC instruments, and comprehensive two-dimensional GC (GC×GC) and LC-GC (LC×GC) systems, hyphenated to various MS systems (quadMS, MSMS, high-resToFMS). He is co-editor of a book on Multidimensional Chromatography, and he has been invited lecturer in national and international congresses and meetings. His research interests include Chromatography techniques and the development of coupled techniques such as LC-GC-MS, GC-GC, GCxGC, LCxLC, LCxGC and their applications in the study of natural complex matrices. Prof. Mondello has been member of the scientific and organizing committees of national and international meetings in the field of analytical chemistry. He was also Chairman of the 36th and 38th International Symposium on Capillary Chromatography and the 9th and 11th GCxGC Symposium, Riva del Garda, Italy and Chairman of the 14th International Symposium on Advances in Extraction Technologies, Messina.